I grew up in Montreal. I now live in Alberta. I’m very sorry, but I have forgotten all my French. I live near Rosebud, Alberta. It’s a small, little-theatre cultural town with a lot of beautiful historic resource. I have worked in the oil patch for 25 years. I have also been banished by the regulator that Mr. David Pryce was so proudly discussing earlier in his presentation. 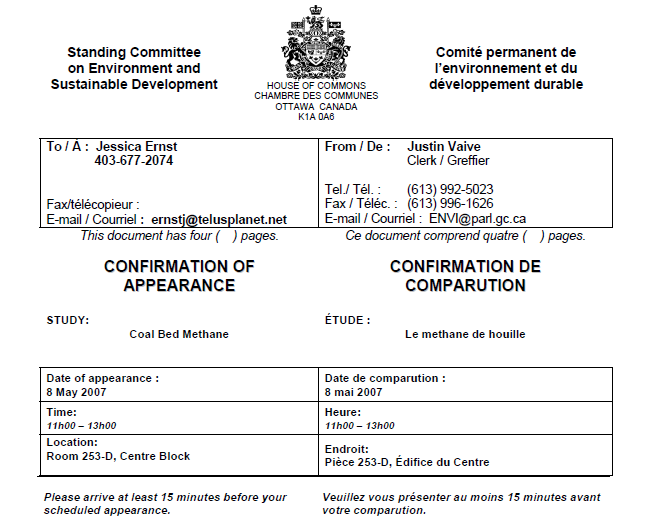 I believe I was banished—this was in writing—by the energy regulator because they were trying to intimidate me. I have evidence of EnCana Corporation not complying with the noise regulations, and the EUB actually covering up for the non-compliance in writing. I believe that the EUB, the regulator, did this to try to silence me. They copied the RCMP. So I’m very surprised that you, honourable members, here have allowed me to speak, because I do believe this was the first time this had happened in Alberta. I have been informed that the banishment was a violation of the Canadian Charter of Rights. I grew up proud to be a Canadian. I grew up proud of our water, of our leadership on peace and mediation, and environmental issues globally. I have worked in other parts of the world. I have to admit, I’m ashamed to be Canadian now, and I plead to you all as this committee to listen carefully and review the documents, and carefully consider whether the federal government needs to get involved. I have never seen such atrocities in my 25-year career of working in the oil patch as I have now seen in the boom: human rights violations, environmental degradation, and disrespect of the legislation and the regulations. In regard to noise, the other day when I was leaving from the airport, the night before I left, the compressor noise—we’re surrounded by 13 EnCana compressors—drove me to distraction. Occasionally the noise is mitigated, but not always. There’s a straw-bale wall surrounding these compressors. I have direct experience with the water. This is my water, on fire, from my tap, poured into a pop bottle, a water bottle. There is no sugar in there. A few minutes later I set it on fire. I’ve lived in my place since 1998, 50 acres. CBM came and my water dramatically changed–a chemical burst on my skin and eyes. My dogs not only refused to drink the water, but they would back up. White smoke was coming off the water. There were whistling taps. I didn’t know what it was. I was really busy. I thought it was my plumbing. I thought, “Oh my goodness, I have to replace the taps.” Little did I know that I was living in an explosive time bomb. It was methane and other hydrocarbons coming out of my taps. Sometimes I couldn’t even close my taps there was so much gas. I couldn’t get suds out of my soap or shampoo anymore; the water changed. Also, living rurally, you know you get stains on your plumbing and toilets—sorry to speak so intimately. All of a sudden my toilets went pristine, brand new. Something got rid of the stains, I think probably what was burning my skin. Mr. Pryce mentioned the good regulations. This happened in 2004. These are the two aquifers in my community. This is an EnCana well. It fractured into—into—our aquifers. So the protection and the separation that was discussed is not possible. Perforations, which explode through the casing, and then the fracs, and who knows what solvents went into our aquifers? In the States, EnCana was found to contaminate groundwater and did not protect health and safety. This again is another picture of my water, a different picture. I don’t do this in the house anymore because the flame exploded so high it shot up to the ceiling. I’m a blur in the picture—this is me here—because I had to jump; it scared me. We have one out of 20 resource wells leaking. The landowner in an investigation is usually blamed, instead of comprehensive testing of the resource wells. There are ways to find out which gas wells are leaking. They can be fixed. In this case, EnCana has stated publicly that they do not need to cooperate with this investigation because they don’t believe in the science that can lead to finding out which wells are leaking. The regulators misinform the public. We have thousands of resource wells leaking. The new testing that came up only began when a number of concerned citizens went to the legislature and went to the public. The MAC committee was still in deliberation. I believe the testing requirements wouldn’t have happened. We have now had, finally, a number of years of CBM, but our knowledge on groundwater is behind. The precautionary principle: where is it? In 2005, industry advised the Alberta Energy and Utilities Board that some of their shallow fracs were damaging oil and gas wells. So they brought in some new rules. These rules should have been brought in before they began the experiments, especially for our drinking water. This is a water well that exploded last spring. The farmer had dealt for three years with the regulator–the so-called best regulator. What’s wrong with this picture? Three men were seriously injured on sampling day. After contamination, some companies refused to cough up the data that was needed to investigate and remediate. This is a diagram that the AEUB, the energy board, and Alberta Environment go to the public with. They say it never happens. Oh, no, there is no leaking. By the way, methane is a much worse greenhouse gas than CO2, and we have thousands of these leaking methane directly into the atmosphere. There is surface casing vent flow, and gas migration through soils. The interesting thing is that the AEUB, in 2007, is even warning that the gas leakage and the gas migration potential is worse in the shallow zones. This is where we’re going to be doing our CBM and where our water is. In Rosebud water we have 30 milligrams to 66 milligrams of dissolved methane, as well as free gas. CAPP, which is here today on the video, has a report that one milligram puts you at risk of explosion if the water passes through an unventilated place. A light switch, static in my hair, could have blown up my house. The regulator is still in denial. They have done tests on our water. You have a table. We have benzene, toluene, ethylbenzene, and xylenes in our water. We have ethane, propane, methane, butane, and octanes, and we have kerosene in the community drinking water. In most cases, the landowner is blamed for the contamination by way of bacteria. On the table, you can look at the process we have to go through. I read your report that came out recently on the chemicals and your Canadian Environmental Protection Act, and I plead with you to please implement this act in Alberta. We are told that only nitrogen is used, so our water is safe because nitrogen comes from the air. I would like to show you a list. This came from Oilweek. These are a variety of products, hundreds of them, used in different stages of drilling, [f]racking, and servicing. Some of them contain diesel and mineral oil. In Alberta, the regulator does not require industry to disclose any of the chemicals used, not even if they’re toxic, not even if it’s benzene, a known carcinogen, or toluene, which damages the brain, notably in children. Toluene was found in our water. We need to know what the chemicals are, especially so shallow, and I believe that the federal act is perfect. I noticed in your report this is seldom used and seldom implemented. I would like to ask that you use this and implement it in Alberta and ask the regulators to control the chemicals being used. I have seen many pallets of chemicals that aren’t even on this list, bags of chemicals that say, “Danger, Unregulated”. Nobody knows what’s inside, driving through playground zones. We don’t know now how to analyze our water. These chemicals could have gone into our water, but we don’t know what to test for. I also brought with me a pledge to protect our groundwater. You had this translated. I would like to ask every member of Parliament, not just the committee members, to sign this pledge and fax it to Honourable Minister Baird and our Honourable Premier Stelmach. There are a few things we would like done to protect our groundwater. CBM can be a fantastic new resource. We can all share in the prosperity. Canada is a fantastic country. I would like to see the Canada I knew as a child come back from corporate rule. I would like to see the people in charge. I would like to see public health and safety protected. There are still people in my community bathing in and drinking water with benzene and toluene. We do not need to harm people to have prosperity. Coal-bed methane will spread far. The shales are coming. They will spread far. These impacts, violations of the Canadian Charter of Rights and Freedoms, will spread through the country if we continue to allow industry to rule. 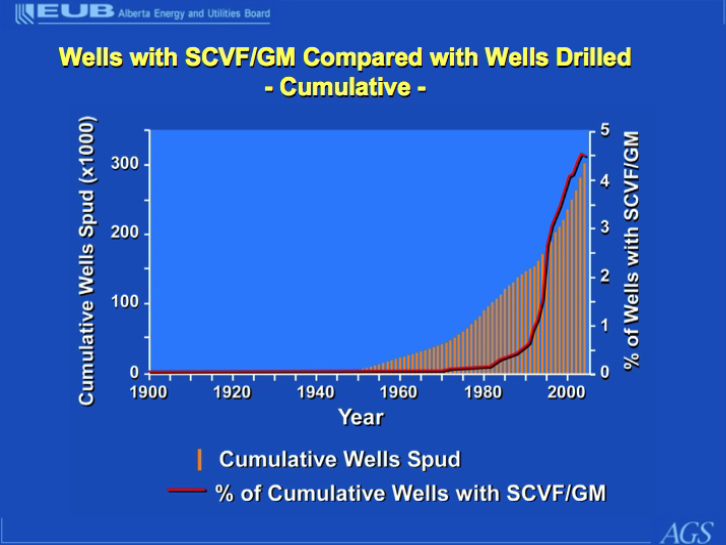 The precautionary principle: why are we allowing perforations and fractures into these shallow zones above the base of groundwater protection? Industry still doesn’t know what these shallow perfs and fracs do. They have stated this in writing to the EUB. Why don’t we learn first? We can do an economical mitigation here, slow down, think first, collect some data first. Let’s find out what we’re doing to our groundwater. This is Canada’s water. We all have water on the table here. This water will affect all of us. The story has been much in the news. I bring one gift for my French friends here today. Quebec journalists are writing three stories on the water situation. In September, I believe, the Rosebud water situation will be published, but they are also writing about climate change. I find it interesting that Quebec is so concerned about what is happening to our water in Alberta that they’re sending journalists out. There is an Alberta Views article. I have copies here for you. They’ve been handed in. Even Canadian Business magazine has published the story about the water. There I am with my water. I can’t live with this water anymore. It’s too dangerous. I have trucked-in water that the Alberta government is supplying and paying for. I’ve lost my independence. I live rurally. I have to rely on trucked-in deliveries. I want my water back. I want to protect water for others. In conclusion, in my experience, the regulations are not working. The regulators are not working. Instead of dealing with the industry’s non-compliance, they banished an ordinary citizen, considered me a threat to safety and the public. I had just found out when I got this letter from my regulator in Canada, a country that I thought was a democracy, that I was living in danger of explosion from my water. Yes, methane can be natural, but it is normally at very low levels. Nothing like the levels we have after this company, EnCana, fractured directly into our potable water supplies. They have cemented this well off, but we do not know what damage has been done to our aquifers. This is very serious.